Why does the Tri-Lakes region need an agency like Tri-Lakes Cares? TLC exists to provide a safety net for low income households in the Tri-Lakes region; and to help those households willing and able, to work toward self-sufficiency. Many households in our service territory do not earn enough income to meet all their basic needs of housing, food, utilities, transportation, and health care. This disparity between household income and necessary daily living expenses often results in generational and situational poverty. There are many factors that contribute to poverty in our region, including the lack of higher paying jobs and public transportation. Northern El Paso County also has a higher cost of living in comparison to areas south. Tri-Lakes Cares strives to help our clients overcome emergencies and work toward self-sufficiency by offering resources to improve education and income by supporting self-sufficiency programs and encouraging job skills training. Archived TLC Videos can be viewed here on our YouTube page. 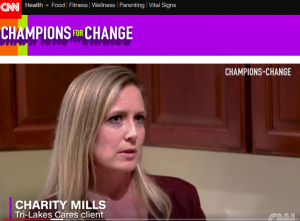 In mid-May 2018, Dr. Sanjay Gupta came to Colorado Springs to film a segment for their “Champions for Change” feature. Tri-Lakes Cares and Care & Share were featured, working to combat hunger in our local region through the Feeding America network.The segment aired on June 20. Watch the story here.